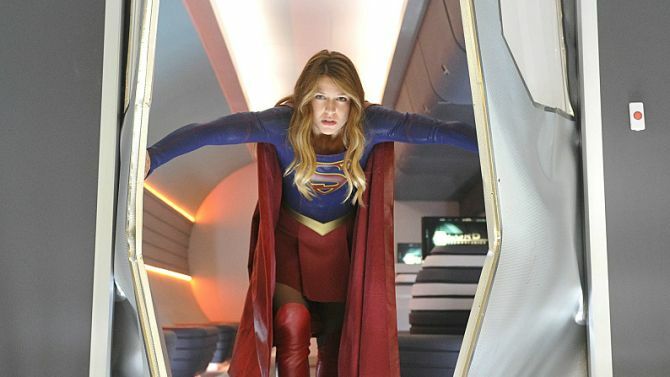 My Geeky Geeky Ways: Supergirl Episode Guide: Season 1, Episode 5 - How Does She Do It? Supergirl Episode Guide: Season 1, Episode 5 - How Does She Do It? Kara must simultaneously protect National City from a mad bomber while also babysitting Cat Grant's son, Carter. Meanwhile, James copes with the sudden reemergence of Lucy Lane - his ex-fiance. Doctor Who (The DEO's shifting ID badges are reminiscent of The Doctor's psychic paper) and John Byrne's Man of Steel comic series, where Lex Luthor faked a terrorist attack to get Superman's attention and test his skills in a manner similar to what Maxwell Lord does with Supergirl here. Why is Alex analyzing the drones and bombs when her she's an expert on alien biology - not technology? Where does Kara get her street clothes from when she flies to pick up Carter? We don't see her carrying a bag. For a train capable of traveling at 500 kph, The Super Rail takes its sweet time getting out of National City. Either that or National City is huge, given how much time the train spends running before Supergirl stops it. It's a brief moment, but we see something of Alex Danvers' brains and strength as she picks apart Maxwell Lord's invention and doesn't back down when he starts trying to push her buttons. It's a wonderfully subtle performance from Chyler Leigh, who probably gets the least chance to be subtle out of all the cast. Again, Peter Facinelli plays a wonderfully smug - yet oddly sympathetic at times - Maxwell Lord. Melissa Benoist is always a delight as Kara but I specially like the way she gets astonished that a woman like Lucy Lane sees her as a romantic rival or that Carter Grant has a crush on Supergirl. And once again, the chemistry between herself and Mechad Brooks as James Olsen is the best part of the show. The opening sequence in which Kara gets into a dog fight with a drone is amazing. Cinema-quality flying effects. The scene of James speeding to the airport to stop Lucy after he hears about the bomb there as Kara flies past him going to stop the bomb on the train is a nice bit of visual juxtaposition. This was originally meant to be Episode 104 and was scheduled to air on November 16, 2015. Due to the plot involving terrorist bombings, it was decided to postpone this episode's air date for one week and the original episode 105 (i.e Livewire) was aired in its place. Cat Grant wins the Siegel Price For Women In Media. This is a clear nod to Jerry Siegel - the writer who co-created Superman with artist Joe Shuster. We see Hank Henshaw's eyes glowing as he begins to disassemble the bomb at the airport. This would seem to be an indicator that the DCTVU version of Hank Henshaw has the same mechanical empathy technopathy powers as his comic-book counterpart, who later became The Cyborg Superman. The bar/restaurant which Kara meets Lucy at is called Noonan's. This may be an ironic nod to Noonan's Sleazy Bar - the favorite watering hole of super-powered assassin Tommy "Hitman" Monaghan in the comic Hitman. The drones following Supergirl are advanced Earth technology - not alien. Kara is capable of lifting the weight of 120 pounds per square foot multiplied by five floors. Sadly, without a length and width of the space she was supporting, this doesn't give us enough information for an exact measurement of her strength. The lab that was blown up was developing a cutting-edge non-lithium battery. Both the drones following Kara and the bomb used an advanced fiber-optics relay system developed by Lord Technologies, that is not on the market yet. The DEO have special badges that can be made to hologramatically appear to be other forms of identification. In this case, Alex changes her ID to read FBI instead of DEO. Maxwell Lord's Super-Rail train runs on electromagnetic propulsion. The lack of friction allows it to reach speeds of 500 kph. The mag coils use liquid helium as a coolant to prevent overheating. Liquid helium is used to prevent the creation of hazardous byproducts. Maxwell Lord dismisses the idea that the second bomb could go off by handling it, due to it having the fulcrum weight of a helium core. The second bomb has the capacity to produce an over-pressure of 2,000 pounds per square inch. That's enough force to level 30 city blocks. Supergirl can reach speeds of, at least, just under Mach Two (1522 mph). The DEO developed a device that basically appears to be a high-tech tanning bed. It emits concentrated solar waves mimicing the light of Earth's yellow sun. This recharges Kryptonian physique and hastens her healing abilities. Knox's body bomb is rigged with an altimeter. This will cause it to go off if he is moved. Alex examines the airport bomb and determines that it had a remote kill-switch. This calls into question Henshaw's claims that the bomb was a dud. Kara: That sounds like a woman who knows what she wants. (quickly) I used my regular hearing on that. James: All that she wants is to win everything. Win every case, every argument. And now she wants to win me. Kara: Because you broke up with her? James: Uh... I moved away. After she dumped me. Kara: How did... (laughing) How is that even possible? James: She's obsessed with her career. And I was a distraction. Kara: Well, you're... You're totally not a distraction. Carter Grant: My mom says it's okay to be a nerd. She says if you can face your fears and come out of your shell, then... nerds can win in the end. Kara: God, I hope so. Max Lord: Tell me, Agent Danvers, why are you wasting that brain kicking down doors for the government? Alex: Why do you mistrust the government so much? Max Lord: Answering with a question, keep the subject talking. Basic field agent procedure. And here I thought we had something special. Alex: Okay, fine. I work for the government because I believe there's no higher calling than helping others. Max Lord: I feel the same way. Only I do it without a gun. The world needs a new kind of hero. Alex: I thought we just got one. Max Lord: (chuckles) Supergirl's just a glorified fireman. She's not going to solve the underlying problems that are actually destroying this planet. Alex: You really don't trust anyone, do you? Max Lord: I've never met anyone worth trusting. Alex: Well, that is a very lonely way to live. Max Lord: You have no idea. Kara: I need you to watch Ms. Grant's son. Winn: Whoa! Like, really? 'Cause I am not good with kids. Kara: (beat) You eat cereal for dinner and your desk is covered with toys. Winn: They are NOT toys! They are adult collectibles! Lucy: Jimmy thinks my work came between us, but he's wrong. Maybe I should've appreciated him more, but the reason I prioritize work, is because he prioritized... him. Lucy: No matter where we were or what we were doing, Jimmy took off the moment Superman called. And I couldn't complain, because of course they were off saving people's lives. He says I left him, but... he left us first. Kara: (stammers) Lucy, I'm so sorry. Lucy: And this hero wears a skirt! How am I ever gonna compete with her? Alex: Why are you fighting me? I'm trying to protect your train. Max Lord: I don't put much faith in the government's idea of protection. Alex: I read your file. Your parents were doctors who developed vaccines against bio-weapons. They worked for the government. They didn't see it as the enemy. Max Lord: No, they didn't. So when they raised concerns about the safety of their lab, they trusted the government's findings. "Acceptable risk levels." Two months later, an air system malfunctioned. A virus entered their pressure suits... Their internal organs melted. When it was all over, there was nothing left to bury. Max Lord: (scoffs) That's the first apology the government's ever given me. Alex: They covered it up. Max Lord: You can't be surprised. Alex: What happened to you was a tragedy. I'm trying to prevent another one. Rejecting our help is not rational. You are a man of logic, Max. Max Lord: I'm also an orphan. We don't get over things easily. Kara: Look, I don't know anything about romantic love. I have not had the best luck with it. But if I ever really had it, I think I'd fight for it. James: I already put that behind me, Kara. I don't want to go back there. I - I don't want to do that again. Kara: Who does? But, I mean, are you really ready to move on? Because if you're not, that might not be fair. Kara: To... whomever comes next. Max Lord: (chuckles) What can I get you? Or are you not allowed to drink and fly? I don't know the rules. Supergirl: Caught your press conference. I was surprised, you're usually a little more glib. Max Lord: There was nothing to be glib about. A sick little girl lost her father. Supergirl: That little girl's being treated by a doctor who has a lifetime grant from your company. You said tonight you always build in fail-safes. Like the kill switches in those bombs. Something tells me that there was a fail-safe in Knox's bomb, too. One that you could've remotely activated if I didn't save you in time. You forced Knox to plant those bombs in exchange for saving his daughter's life. Max Lord: I would never barter a child's life. I can't speak for Knox's motives. He clearly went insane. Supergirl: Maybe you didn't expect Knox to vaporize himself, but I do know this was all a ruse. I just can't figure out why you did it. Max Lord: Fascinating theory. Unprovable, but worth exploring. I suspect that whoever is responsible for these attacks might be curious about you, Supergirl. What is she made of? How does she do it? Supergirl: (realization) You were testing me. Max Lord: (laughs) And what would these tests have shown us? The drone would have measured your agility. The building explosion, your strength. The next bomb would've demonstrated your speed while also revealing you're not actually invincible. Max Lord: But the results of that last test are the most intriguing of all. You chose to save a hundred people on that train, instead of thousands at the airport. One might deduce that there was someone on that train that you cared about. And finding that person is the key to revealing who you really are... when you're not flying around wearing that "S."
Supergirl: For the record, I care about everyone. You may have fooled this city, but I know you were behind this. And I'm watching you. This isn't over. Max Lord: Finally, something we can agree on. The fun is just beginning. Director Henshawk asks if the drone following Kara could have been sent by Astra, last seen in 102. This is the first year Cat Grant has gotten the Siegel award. Lois Lane has a freckled nose. Lucy Lane is a military lawyer, working out of the Judge Advocate General division. She dislikes handling AWOL cases. She dumped James Olsen before he moved away. Cat Grant's son Carter appears for the first time. He's an avid Supergirl fan. A news report mentions Maxwell Lord's super-train from 102. Carter refers to Supergirl beating Reactron in 103. Kara refers to Cat trying to get James to use his connections to introduce her to Supergirl in 102. Kara sees Director Henshaw's eyes glowing red while barely drifting in and out of consciousness in the DEO headquarters. Lucy refers to James fighting Reactron alongside Supergirl from 103. Maxwell Lord also owns an airline - Lord Air. Director Henshaw is confirmed to have some kind of power, which he uses to deactivate the airport bomb. Winn is capable of hacking hospital records. Possibly the best episode of the series to date and not just because it's so light on Cat Grant. Everything just clicks here. The direction. The effects. The performances. It's all good.